After nine years of building surfboards, Geoff Prindle decided to get into catamarans. It was 1968, the same year that he founded Surfglas with his partner, Sterling Santley. He really got into the catamaran scene heavily and placed second behind Hobie Alter in the Hobie 14 National Ratings. When everyone moved to the two-man cats, however, Geoff was not happy with the available designs. He was looking for a boat that could sailed effectively with an average husband-wife crew. Out of his search for this boat grew the plans for his new catamaran design. In August of 1971 he came out with the prototype of the Prindle 16. He and his sailing buddies tested the design for a full year before coming out with the production boat. Further racing at Dana Point and Long Beach enable Geoff to further improve the boat. Soon the Prindle 16 was a force to contend with - light, strong, and fast. It could cut smoothly through the water because of its fine bow entry and was not as susceptible to pitchpoling as other similar designs. Before long there was a complete dealer network in operation across the U.S. and Hawaii and hundreds of the Prindle 16 were existent. Classes sprung up everywhere. Two year in a row the boat won the "Most Efficient Catamaran Trophy" award at the Pacific Multihull Association's World Speed Trials. Then for the big boys, Geoff came out with the Prindle 18. It was bigger, more powerful and faster, with much more buoyancy. Yet this boat was easy to handle and very light to handle on the beach. It really looked like an overgrown Prindle 16. Then came the Prindle 19, 18-2, 15, et al. The boat designs are still in production, but Geoff is no longer doing the work. 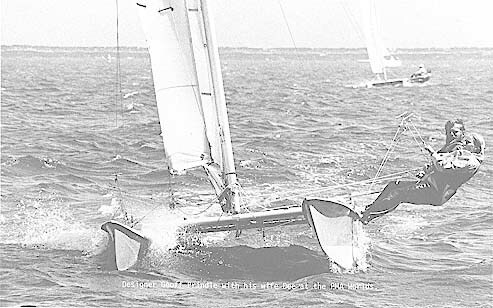 He sold to Performance Catamarans of Santa Ana, California who also produces the full line of Nacra and Inter designs. Geoff's designing and building abilities gave the sport of beachcat sailing a real shot in the arm.